A student walked past school buses outside Codman Academy in Dorchester on Wednesday. 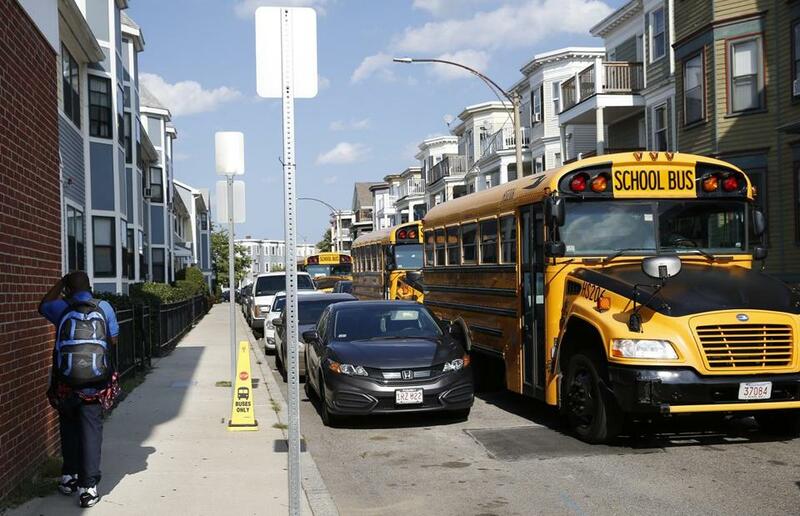 Amid tense contract negotiations, Boston school officials grappled for a second day with an unexpected number of bus driver absences, causing students and families to scramble to find other ways to get to school. Buses ran as much as two hours late, prompting families to hastily rearrange schedules to drive their children to or from school. In a city that spends $120 million annually on school transportation, parents voiced frustration that the school system is unable to provide a safe and reliable bus service. The bus problems are creating headaches for many schools — mostly independent charters — that started the school year early in hopes of squeezing in more learning time. The school system is responsible for busing charter school students. While the number of affected schools was small, how smoothly the buses run now is a gauge of what problems, if any, the city’s entire school system might experience when all classes begin. The first day of school is Sept. 6. 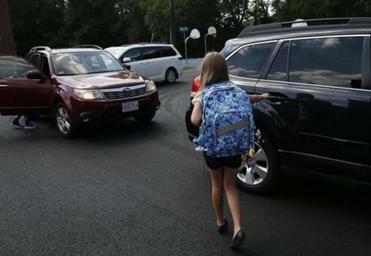 At least 20 school districts issued early dismissals or class cancellations, some even on the first day of classes. Ancrum’s son, who requires door-to-door bus service due to a disability, waited about 2½ hours Wednesday morning for a bus, while one never showed up on Tuesday, Ancrum said. This is the third year in a row, she said, that she has dealt with problem buses and found the school system slow to address them. “They are leaving our kids stranded, and we can’t leave work,” said Ancrum, an admissions counselor at a local hospital and a member of the citywide Collaborative Parent Leadership Action Network. Interim Superintendent Laura Perille declined an interview request Wednesday, while the School Department, for a second day in a row, would not answer questions about whether the driver absences might be due to labor unrest. The School Department was still calculating driver absences on Wednesday evening. But officials said only 20 out of 505 morning and afternoon routes were uncovered, although the school system eventually found drivers for four afternoon routes. Ten schools were affected. Drivers typically cover up to three routes in the morning and up to three in the afternoon. By contrast, on Tuesday, 22 bus drivers had unexcused absences in the morning and 28 in the afternoon, leaving 43 bus routes uncovered, affecting a dozen schools. The problems come as the bus drivers union and Transdev have been trying to negotiate a new contract to replace an agreement that expires on Friday. Talks have been characterized as tense by the union, which began circulating a flier this week listing its concerns and accusing Transdev of demanding one concession after another. Drivers are seeking a cost-of-living increase, affordable health care, disability coverage, other benefits, and well-trained bus monitors for every bus, while condemning proposals to outsource their work, reduce allotted time for daily bus inspections, and other measures at the bargaining table, according to the flier. The flier appears on a Facebook page called Team Solidarity — the Voice of United School Bus Union Workers and includes a vow to “Shut. Transdev. Down.” However, the flier makes no mention of any strike or work stoppage for the start of the school year. The bus drivers union, as part of a deal that extended their contract from June 30 to Friday, agreed to provide the city with 48 hours’ notice if the group intended to strike. The deal was hashed out this summer after the union voted on June 21 to authorize a strike vote and then held a rally the next day during which members said in published reports that they held a two-hour sit-in at School Department headquarters, while Aretha Franklin’s hit “Respect” repeatedly blasted from a loudspeaker. The rally, during which members held such signs as “no contract, no work,” coincidentally was held the same day that former superintendent Tommy Chang publicly announced he had resigned from the job. Less than a week later, Mayor Martin J. Walsh expressed concern during a meeting at the Globe that drivers might strike, as Perille sat at his side. Perille said during that meeting it was the first she heard of the potential crisis. Walsh declined an interview request and instead issued a statement, saying he was “very frustrated with what happened” on Tuesday. “Everyone involved needs to work to get this done,” he said, referring to the contract talks. The School Department would not comment on the negotiations. City Council President Andrea Campbell said she has been pushing the school system to find ways to trim transportation costs, including outsourcing some of the work. She urged officials to issue a request for proposals to find out what other transportation options might exist. “We are clearly not getting transportation services our families deserve,” she said. Auston Harris, a school bus monitor, said he waited a half hour in the dark Wednesday morning for his school bus to pick him up, but eventually learned the driver was absent and the route to Brooke Charter School in Mattapan would likely go uncovered.